This year's FoHM AGM was held in The Waterside Hotel, Inverness on Wednesday 21st March 2018. The Meeting was attended by 13 Members with 5 proxies being recorded, and apologies received from 23 other Members. The business of the evening was conducted efficiently with the Annual Report from the Committee along with Accounts and Previous Minutes being delivered and approved. Three Resolutions were approved as previously circulated; a maximum of 10 committee Members, annual subscription period 01 January - 31 December, and Accounts to be Independently examined. Subscriptions were retained at £5 per annum, with £10 for a family. The current Committee either continue in office, or were re-elected after their current two-year tenure. Suggestions for future Society activities were recorded by those present during refreshments. A demonstration of solo Bagpipe playing was made by Our Music Grant recipient Kyle Cameron, and this was enjoyed hugely by all. It was most gratifying to see and hear such an accomplished young player who is also testament to the benefits of FoHM funding. Videos were shown afterwards with footage of the recent concert at the end of the Voyage of the Hector Ensemble weekend described elsewhere in this website News Section, along with footage of the joint venture by FoHM with Feis Inbhir Narainn, the Come & Try It Tent at Belladrum Tartan Heart Festival in August 2017. Thanks to all who attended and supported the AGM. Last year's FoHM AGM was held on Wednesday, 15th March 2017 in The Waterside Hotel, Ness Bank, Inverness. The good turnout of members for the Meeting was appreciated, and useful discussion regarding future projects and direction for FoHM was had as part of the final business section. Convener, Moira Leslie, gave a detailed report for the year which can be accessed via the Link below. New Office Bearers and Committee Members were appointed as necessary, and these individuals are listed in the Ongoing Work Section of the website. Thanks were expressed for the long service given to FoHM by Jim Leslie and Alan Findlay who stepped down from the Committee at the AGM. 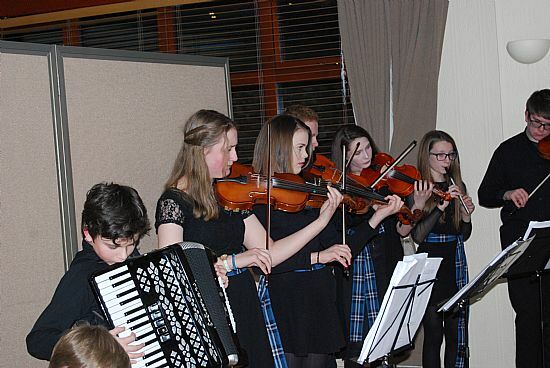 The evening was rounded off with entertainment from Astar, a band of young musicians led by Fiddler Rachel Campbell, as seen by the images below provided by Jim Leslie. This dsplay of young local talent using varied instruments and song was much enjoyed and appreciated by those present. 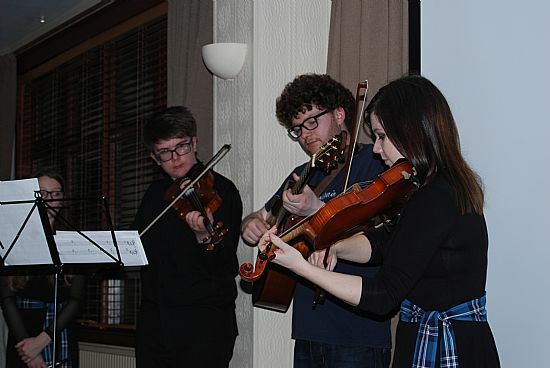 Two of the North's most entertaining and proficient fiddlers gave an outstanding concert for Friends of Highland Music at the Waterside Hotel on May 7th 2015. Then they played together giving a superb performance which wowed our capacity audience! This was Friends of Highland Music’s 8th Spring Event. From 2012 the event became a presentation of a personal journey though music and song. 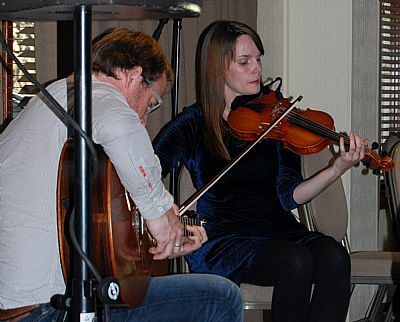 2015 - Lauren MacColl and Graham Mackenzie - two wonderful fiddlers!